Have you ever wished Dinner would just make it's self? Well your in luck because our Freezer Meal Plans offer you the Ability to Shop Once, Cook Once and have 20 Meals ready to Go in your Freezer in just a few short hours! It's the closest thing to Dinner Making it's self! 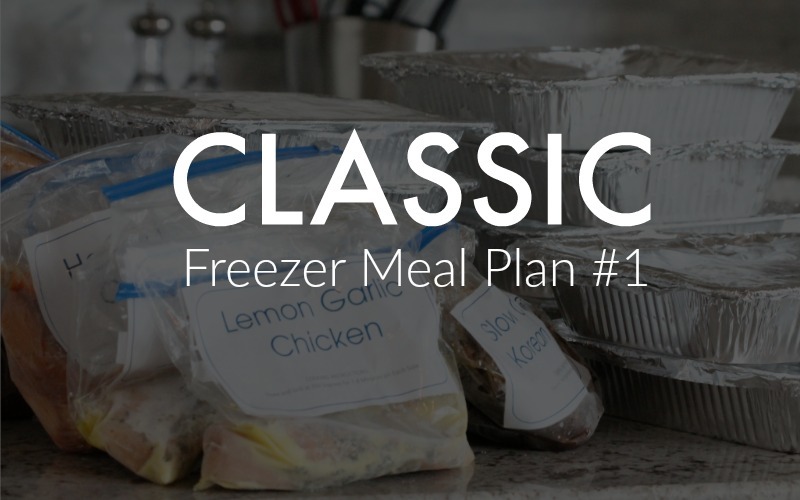 The Classic Family Freezer Meal Plan #1 is perfect for buys Moms, Dads, Caretakers & More who want to have complete meals ready to go in their Freezer, All you have to do is Thaw and Bake! It's so simple! This plan features 10 amazing recipes and a shopping list to assemble 20 Freezer Meals (2 of each recipe) for around $150! This Shopping List & Recipes Collection features the complete shopping list and 10 full recipes so you can stock your freezer with 20 meals for around $150! You'll have everything you need to go shopping and start assembling each Freezer Meal in just a few short hours! This plan makes 20 Freezer Meals (2 of each recipe) So your Freezer will be FULL! We eat these meals over about 1-2 months normally but they will keep in the freezer for up to 3-6 months! These plans are perfect if you know life will be busy, you're having a new baby, or life is changing and all the craziness means you just need to be better prepared when it comes to dinner time. Basic - Includes the Shopping List and Recipe Cards only! Premium - Includes Everything you need to make this plan SIMPLE and EASY! You'll get our Shopping List, Recipes, Bag Labels, and access to the Full Length Assembly Video. - This is what I recommend if you're new to Freezer Cooking because it's the most comprehensive set of instructions, and you get access to the video which lets you join me in my kitchen as I make this plan. Buy All 3 Premium Plans & Get 1 FREE! Get all 3 of our Freezer Cooking Meal Plans & Save! You will get access to the Slow Cooker Premium Plan, the Classic Freezer Cooking Premium Plan, The Grill Bag Meal Plan and also the 1 Week Freezer Cooking Plan! Get access to all 4 plans for only $23.97! That's like getting the 1 Week Plan for FREE!